There are more expensive hobbies than shooting. Owning horses could probably only be pricier if the animals ate dollar bills instead oats, and there are plenty of guys out there who’ve spent more money on their model train setups than their own homes. Still, that’s not to suggest that shooting is a cheap hobby -- getting anywhere near proficient with one particular firearm is bound to cost you a small fortune. Fortunately there’s MAXX Tech, ammo which won’t cost you an arm and a leg but still delivers the performance you need to effectively whet your skills at the range. This 40 S&W cartridge is capped with a 180 grain projectile, a weight which should already feel familiar to you if you’ve spent any amount of time firing a 40 S&W. The bullet has got a full metal jacket, so your semi-automatic’s chamber won’t choke on it and its bore won’t immediately foul with lead residue. Unlike much other budget ammo on the market, this round features a brass casing as well as a non-corrosive Boxer primer. It’s a heck of a value for a whole case of what you need to keep shooting! We don't have any reviews yet for this particular .40 S&W (Smith & Wesson) ammo from MaxxTech. 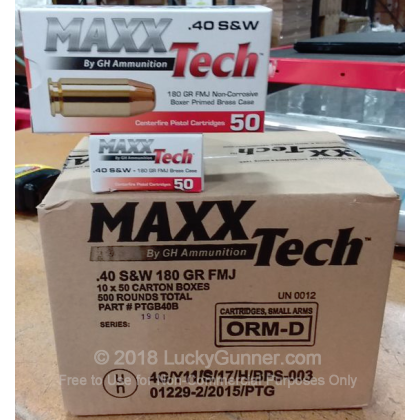 If you'd like to be the first to review this particular .40 S&W (Smith & Wesson) ammo from MaxxTech, fill out the form below. We also have this 40 S&W - 180 Grain FMJ - MAXX Tech - 50 Rounds ammo in stock in a smaller quantity.